Help Center: How can I send a group email to my students? When you are logged into your school's account, click on the tab called "Student Outreach". It will give you three options for email templates: one is designed to email students who have not yet registered with your school on CareerExplorer, and another is for students who have yet to visit your university's career centre. 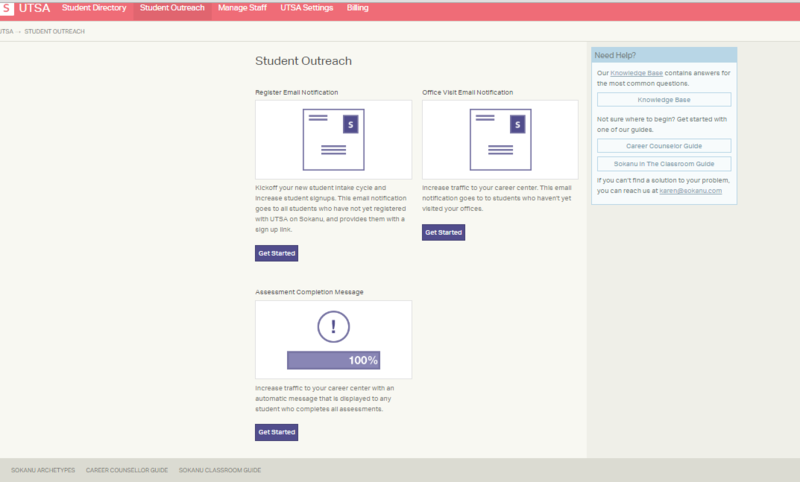 The third option is an automated email that gets sent to any student who completes their full assessment; this email is designed to increase traffic to your career centre by enhancing student engagement on-campus. If you would like to send an email that is different from the above options, you can return to the previous screen ("Student Directory"). You'll notice that the right-hand nav bar has an option to "Export students to CSV". Once you export your CSV file, you should easily be able to extract some or all of the email addresses in your list (depending on how many people you wish to contact). Plug these email addresses into your own email client and fire away!